This is our custom-built D-Sub 25 Male to D-Sub 25 Male top quality 8 channel AES/EBU Digital Mogami snake cable (In and Out Configuration). 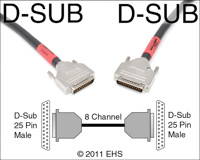 This is wired as a crossover cable to feed back and forth on a set Send-Return configured D-Sub's. You won't find a nicer snake anywhere. Construction is Male DB-25 to Male DB-25 with Mogami 3162 cable, connectors have shrink tubing for color code and strain relief. Mogami wire is (as far as I'm concerned) the best wire, used in the best studios for it's ultimate sound qualities and durability. Mogami 3162 cable is very flexible, durable, heavy-weight cable. Metal: Ultra heavy duty metal hood with thumbscrews, Metal offer extreme durability and RFI/EMI protection. Metal 45deg Out: Ultra heavy duty metal hood with thumbscrews and a cable output at 45 degree, Metal offer extreme durability and RFI/EMI protection. Photo 1 shows the two ends with red shrink color labels and visual wiring layout. Photo 2 shows expanded view of the two ends with red master.